Top 11 Must-Watch Summer Anime 2016 List | Nerd Much? Things are heating up in the anime world, as the summer anime season has begun! It has been a pretty strong year for anime already, and it isn’t stopping now. The summer is filled with amazing new shows with substance, smarts, and amazing characters, as well as continuations of some of the best series in the recent years. 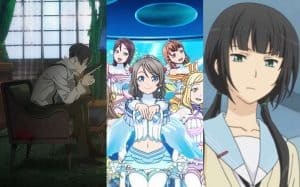 This anime list below of this year’s new anime summer content contains the most promising new series and continuations of anime from the past, with new seasons and reboots aplenty. Anime that premiered last season and are continuing through this season do not count (Sorry Jojo’s Part 4!). Also, this list is definitely not ranked and is measured by potential, not the first episodes. Ready for despair? It’s a great summer for Danganronpa fans, as there is not one, but TWO parts to watch this summer. Under the name of Danganronpa 3, these parts will be split into Future and Despair arcs. Future will take place after the events of the second game, concluding the Hope Peak’s storyline. This will feature fan favorites, as well as explanations for what happened after the second game. The cast will include graduates of Hope Peak’s Academy, members of the Future Foundation that are out to fix the world that was nearly destroyed from the despair-inducing events of the games. The Despair arc will be the prequel to the events of Danganronpa 2. Without going into spoiler territory, this arc will explain why the events of the second game happened. It will also depict the school life of the various characters. Although Danganronpa is known for its crazy premise of trapping students of the Hope’s Peak Academy in a killing game, the anime series is deviating from the class trial/investigative formula to focus on the story. This will be a great chance to explain/conclude the Hope’s Peak storyline and pave the way for the future game, Danganronpa V3. What if you had the chance to start over from your last year of high school? ReLife is about an experimental program for NEETs/shut-ins, offering a pill that gives those who sign the contract a younger appearance and the chance to completely change everything. The protagonist is a 27-year-old NEET, living off the money his parents send him and pretending to have a job to his friends. In reality, he landed a job after grad school and quit, never to be hired again. However, one chance encounter with a stranger at night resulted in him taking part in a program that would transform him and give him another chance at life as a third-year student in high school. What’s really nice about this series is that it covers a very real and revenant topic, trying to find one’s self, especially if they went down a career path they were unsure of. It’s smart, witty, and has plenty of humor. Another perk is that ALL the episodes were released at once, so it can totally be binge watched from start to finish without waiting week to week, making this anime a must watch. Going along with the choices in life we must face at a young age, orange deals with many of the problems found in ReLife, but with a different twist. Naho Takamiya, a high school girl, starts to receive letters from her future self, asking her to prevent the “biggest regret” of her life. This regret is related to the new transfer student, a boy named Kakeru. The story takes a dark turn, filled with the idea of parallel universes as well as instances of suicide and death. It’s up to the characters to receive the messages from the future and preventing the “regret” from ever occurring. orange is an emotional love story that has much potential as an anime series. It is based on the manga of the same name. Many anime series feature characters that are in high school or have just reached adulthood, so it’s super nice to see series that feature older characters or are considered part of the “seinen” (geared toward young adult males) genre. This anime follows the single father/teacher Kōhei Inuzuka and his daughter Tsumugi’s adventures. Inuzuka sets out to be a good cook for his daughter, even though he does not have much experience. However, one day, a high schooler and student of Inzuka named Kotori offers to help him take care of his daughter and learn to properly care/feed her. This show is meant to be a feel good slice-of-life anime, and it has much potential to be a memorable series. Much historical anime are set in the times of samurai or the events of WWII, but it’s rare to see an anime set in the time of the Prohibition. 91 Days takes place in a town named Lawless that traffics liquor and alcohol. The protagonist, a man named Avilio, finds himself in Lawless to seek revenge on for his family’s murder. Disguising himself and putting on a facade, he seeks to bring down the Vanetti family, by befriending Nero, the son of the Vanetti’s. The story takes place over the course of 91 days and is said to be packed with plenty of action, murder, and tragedy. It certainly sounds like an intriguing plot and one of the only anime series geared towards an older audience this season. Some series do not get a continuation for years to come, leaving the fans of the anime hanging for quite some time. Series also must wait until a certain point to catch up with the manga. Something like this happened with D. Gray-man, a shounen series that ran for 103 episodes from 2006-2008. Now, 8 years later, it is finally getting a continuation called Hallow. For those who are new to the series, D. Gray-man follows the adventures of Allen Walker, a boy with the ability to destroy Akuma with his left arm. After some time, he takes the title of an Exorcist, joining the Black Order that longs to stop the Earl. Hallow is a continuation of Allen’s role in the Black Order, so it’s highly suggested to watch the first season before diving into this part. The Love Live franchise has surged in popularity ever since the first anime series release, so it’s no surprise that the follow-up anime would be on this list. Although μ’s story came to a close, they inspired an entirely new school to start a school idol club. The premise is the same as the original series: a school is in danger of closing, a girl wants to save the school, and then she creates an idol group, called Aqours. This time, the series takes place in a seaside town and has an entirely new cast, including protagonist Chika Takami. The cast is full of cute and vibrant characters that make Love Live! so addicting and special. However, it will be hard to live up to the original cast, but Love Live! Sunshine!! definitely has potential and will be a feel good idol series for the summer. We have sports anime for nearly every sport and genre, so a male cheerleading squad is next on the list, with an interesting premise. This series follows a male cheerleading team at a college, called “Breakers”. Haruki, a former Judo martial artist, quits his first year of college and is invited to join the Breakers. Joining him is Kazuma, his childhood friend who wishes to honor his parents who have passed away and had a love for cheerleading. It’s very interesting and refreshing to see an anime take on the sport of cheerleading rather than the typical/popular sports, such as basketball, soccer, baseball, and more. This series is also definitely geared towards a female audience with an “odd and cute” male cast. Many JRPG series are turning to anime to not only include in their games but to provide access to their story to a whole other audience. Tales of Zestiria is following the same formula, but with a full-fledged anime series. Tales of Zestiria the X follows Sorey, a human who grew up with spirits called seraphim. He wishes that both humans and seraphim can no longer live divided and coexist, making it his life mission. However, after visiting a human capital city, he unleashes a holy sword and begins a new role in life, to end despair and “calamity” in his world. This is the basic buildup to the Tales of Zestiria game and anime. There is much potential here for those who are fans of the Tales of games, as well as those who may be interested in playing them in the future. Continuing where the first season left off, Food Wars The Second Plate serves up a great anime season for eager fans. For those who don’t know, Food Wars is the cooking anime known for its exaggerations, humor, suggestive cooking methods, and likable characters. Instead of starting off at the beginning of Soma’s cooking academy life, the season begins in the midst of the Autumn Elections, an intense cooking battle that determines the most elite of each school. Fans are likely to be happy with the return of the entertaining series. Last but definitely not the least (and probably one of the best this season), Mob Psycho 100 deserves a spot on the list. Created by the mastermind behind One Punch Man, Mob Psycho 100 features a similar art style and unique storyline. The story follows Mob, a middle school boy with insane levels of psychic powers. However, with intense powers comes isolation, especially with the reactions others had to him using his mind-bending abilities. All he wants is a regular life , to befriend a girl named Tsubomi, and to figure out his purpose on Earth. Luckily he achieved a new mentor to help him cope with his psychic abilities. Given the success of One Punch Man, Mob Psycho 100 has extreme amounts of potential to become a hit anime for years to come. Although it isn’t an anime series (yet) and doesn’t premiere until September (but still in the Summer anime cour), the Persona 5 OVA is still worth mentioning. A bit of a surprise announcement at last year’s Tokyo Game Show, the Daybreak OVA will cover the prologue of the story, giving viewers an introduction to the game There’s a stalker around town, and the protagonist fights him after an incident, which will lead to the awakening of personas and the beginning of the game. Like Brotherhood: Final Fantasy, this OVA will give those who may be interested in the game a backstory or setting to get them acquainted with it before buying, which is totally worth it. What’s YOUR favorite summer anime so far? Sound off in the comments below!